Kinesio Taping is a state-of-the-art athletic injury tool used to help athletes and runners with injuries. Instead of a brace, Kinesio Tape is used to help runners keep their muscles and joints in alignment. There are many other similar tape brands available such as Rock Tape or KT Tape. Kinesiotape is the original but functionally they all work the same. In our opinion Rock Tape H2O has the best glue and therefore stays on the longest. “This is not just tape… it is a special tape, with magic powers” – Lance Armstrong. Best of all, Kinesio Tape is waterproof and stays on for days, even for triathletes. At the San Diego Running and Sports Injury Clinic you can be advised if Kinesio Tape will help your injury and if it is can be taught how to tape it correctly. Kinesio Taping is an exciting new form of athletic training that can improve performance, enhance circulation, prevent injury and allow a runner to train and compete with an existing injury. Kinesio Taping was developed in Japan and has gained popularity after being used by the Japanese Olympic volleyball team in the 1988 Seoul Olympics and Lance Armstrong and the US Postal team in the Tour De France. Many professional sports teams are also beginning to understand and utilize Kinesio Tape. The Seattle Mariners and New York Jets are two of those progressive teams. 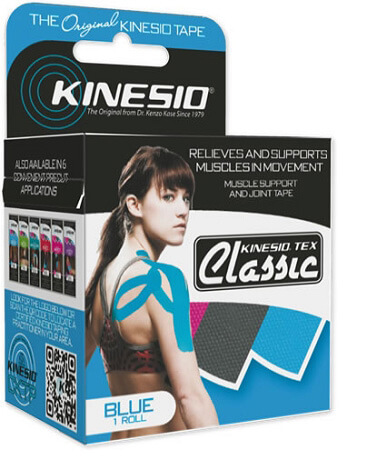 Kinesio Tape is a malleable, waterproof athletic tape that can be applied over the muscle and provide support and additional feedback to that muscle and your central nervous system. When applied properly by a certified Kinesio Taping Practioner the results can be astounding. Some conditions successfully treated by Kinesio Tape at the San Diego Running and Sports Injury Clinic are Patellofemoral Pain Syndrome, Chondromalacia patella, VMO insufficiency, Achilles tendonitis/tendonosis, Plantar Fasciitis, Shin Splints and Bunions. Athletes treated with Kinesio Tape experience the benefits immediately and without restraint. The tape neither limits normal range of motion nor prevents the athlete from performing their usual motions. In addition, after the tape is applied it will stay on the treated region for up to 4-5 days without the athlete losing the benefits. This is different from most other taping methods that can not get wet, which prevents the athlete from showering or even competing in water sports. With Kinesio Tape the athlete can get taped up to 2 days pre-event due to its unique properties. Kinesio Taping method is a relatively new physical modality currently being introduced and utilized by various practioners. Kinesiotape was developed by Dr. Kenso Kase in Japan during the mid 1970’s and is now being taught at major universities in addition to being utilized by many professional sports teams. It is difficult for practicing therapists to embrace a new technique, many even labeling it as unscientific and claiming there is little research to support its use. It may be true that there is currently a lack of scientific data in the form of double blind, placebo controlled studies. However, there are many modalities, such as ultrasound that are currently being used by physical therapists, chiropractors etc. that have been proven in the scientific literature to be no better than placebo (1, 2). While the purpose of this article is not to debate the pro’s and con’s of existing accepted modalities or compare their effectiveness vs. Kinesio Taping method, it does illustrate the flaws with the above described logic. Numerous anecdotal reports exist where clinicians and patients have reported almost miraculous results after the application of Kinesiotape. In this article I will explain the scientific rationale as to why Kinesio Taping Method works and support it with existing neuroscience. Proprioception is generally defined as perception mediated by proprioceptors or proprioceptive tissues (3). Proprioceptor is defined as a sensory nerve terminal found in muscles, tendons, and joint capsules, which give information concerning movements and position of the body to the central nervous system (3). There are numerous proprioceptors that provide our body with mechanoreception. They provide the CNS with information regarding mechanical stimuli. Free dendritic nerve endings are generally thought to be involved in pain transmission (nociception), however, they also respond to pressure and can be found in ligaments, tendons and joint capsules as well as the epidermis. Other pressure receptors found in the epidermis and dermis are the Merkel Discs which respond to light pressure, root hair plexus that respond to hair deflection and surround hair follicles, Meissner’s corpuscles which respond to light pressure, discriminative touch and vibration and Krause’s end bulbs that respond to the same and are found in the dermal papilla of hairless skin. Pacinian corpuscles and Ruffini’s corpuscles can be found in the subcutaneous tissue (fascia), and joint capsules transmitting deep pressure, vibration and stretch. Found within skeletal muscle are muscle spindles which provide feedback concerning the rate and change in length of a muscle and within the tendon there are golgi tendon organs that provide us with information regarding load on the tendon. These receptors provide our central nervous system with all of the above information so that we may have smooth controlled movements occur around joints, provide a reflex mechanism to avoid painful stimuli and allow for motor programming to occur. It is thought among Kinesiotaping practioners that Kinesiotape exerts its effects mostly through affecting the above proprioceptors. To understand how these proprioceptors exert their influence we must review their role in spinal reflexes arcs. Somatic reflexes mediated by the spinal cord are called spinal reflexes. Many spinal reflexes occur without the involvement of higher brain centers (above the spinal cord). It has been shown that these reflexes work equally as well in decerebrate animals. However, the brain is kept “advised” of these reflexes so that it may facilitate or inhibit them. Normal muscle tone depends on stretch reflexes initiated by muscle spindles, which monitor the change in muscle length. During a basic reflex arc a specific reproducible series of events occurs. A muscle spindle is stimulated and the information travels into the dorsal horn of the spinal cord via a large diameter 1a afferent neuron where it synapses onto an alpha motor neuron and onto an interneuron which then synapses onto another alpha motor neuron. The motor neuron stimulated directly (monosynaptically) travels out the ventral root eventually synapsing at the neuromuscular junction and ultimately resulting in a contraction of the agonist. The second motor neuron also leaves the ventral root but ultimately inhibits the antagonist. In this way we have a smooth movement at the joint instead of a spastic one which would occur if both the agonist and antagonist contracted simultaneously. In his book The Neurology of the Joints Barry Wyke stated that arthrokinetic reflexes involve coordinated facilitated and inhibitory effects on motor unit activity in the body musculature in response to joint movement. Theses reflexogenic effects are exerted not only on the muscles operating over individual joints, but also on more remotely located muscles, including those on the opposite side of the body. The 35th edition of Gray’s Anatomy supports these statements “Moveable joints are innervated in general by the nerves of supply to the muscles which act on them. It is probable that this arrangement establishes local reflex arcs both in active movements and postural maintenance”. Hiltons Law also supports this fact. It states that a nerve trunk that supplies any given joint also supplies the muscles that move that joint and the skin over the that joint! This is a profound concept that provides the scientific rationale behind the Kinesiotaping method. By taping the skin the muscles are affected and thereby affect the nerve. By examining basic neuroanatomy and applying the concepts above a better understanding of the effects of Kinesiotape can be reached. The skin over the cervical spine and the muscles that control the cervical spine are supplied by the cervical plexus (C1-4). The muscles and skin of the shoulder and the muscles of the posterior trunk are supplied by the brachial plexus (C5-T1). In fact even the superficial muscles of the back, trapezius and latissmus dorsi (thoracodorsal nerve) are supplied either by the cervical plexus or brachial plexus. When Kinesiotape is applied to the skin over the shoulder the proprioceptive effects are transmitted through mechanoreceptors directly to the brachial plexus. The same is true when we apply Kinesiotape over the posterior trunk; the mechanoreceptors provide information primarily to the brachial plexus (C5-T1). The same mechanism is true for the lower extremity. For example, taping over the anterior knee will provide proprioceptive feedback primarily to the lumbar plexus (L2-4) via the femoral nerve and in accordance with Hilton’s Law. In addition the effects may be felt locally or due to reflexogenic effects even more remotely located muscles, including those on the opposite side of the body. Now consider the various applications proposed by Kinesio Taping Technique. There are techniques for facilitation (O to I), inhibition (I to O), mechanical correction and or functional correction. Let us consider the proposed theory of facilitation first. It has been proposed that by taping from the origin towards the insertion, with the muscle in stretch, the clinician can “facilitate” a muscle. By contrast if one tapes from insertion towards the origin, with the muscle in stretch, inhibition of the agonist will be achieved. Unfortunately this proposition is challenged by existing knowledge of Kinesiology and biomechanics. Whether or not a muscle contraction is initiated from the insertion or origin is irrelevant regarding facilitation (Manual of Structural Kinesiology by Thompson and Floyd). For example, if a person performs elbow flexion against resistance, with the elbows fixed they will achieve contraction (facilitation) of the biceps and inhibition of the antagonist (triceps). However the same is true if we reverse the movement to allow for the origin of the biceps to move towards the insertion as would occur during a “pull-up”. In this case as a person pulls-up towards a given point the elbows are not fixed and in effect the origin (scapula and coracoid process) is pulled toward the insertion (radial tuberosity). The biceps is still facilitated and the triceps are still inhibited. There are many examples for the reversal of muscular contraction for all of our prime movers. The above example would seem to challenge the premise that a muscle is facilitated or inhibited by changing the direction of the taping technique. If we examine mechanical corrections or functional corrections the concepts of facilitation and inhibition may be illustrated. If the wrist extensors are taped so as to limit the amount of wrist flexion then one could say that the wrist extensors are in a “shortened” position and are facilitated while the wrist flexors are kept in a lengthened position and are being inhibited. This premise is supported by the works of Janda and are common suppositions held by the majority of therapists. “Upper-cross syndrome” is usually defined as inhibition and weakness of the scapula retractors and external rotators of the shoulder girdle while the pectorals are over contracted and facilitated (shortened). Common treatment is to stretch the shortened muscles (pectorals) and strengthen the weakened and inhibited muscles (rhomboids, traps, etc). If we understand this concept to hold true then we can apply already existing science to Kinesio Taping Technique. By taping the wrist extensors using a mechanical or functional correction into a “shortened” position we are essentially facilitating extensors and inhibiting the antagonist (wrist flexors). This is achieved by stimulating muscles spindles predominately as they respond to the rate and change in the length of the muscle and pressure receptors (most probably Meissner’s corpuscles and Merkel’s Discs as they respond to light touch and light pressure) and possibly even free nerve endings. Mechanical and functional corrections also provide “tug” on the skin which is transmitted through the fascia to the muscle constantly making the individual aware of the Kinesiotape. This is important due to habituation of the nervous system. A constant non-painful stimulus is usually inhibited by the central nervous system. In the same way we are not constantly aware of the sensation of the clothes we wear due to suppression of the incoming signals so would we suppress the proprioception provided from Kinesiotape applied with the muscle in stretch. Because mechanical or functional corrections do not allow for habituation due to “tug” on the fascia we might better stimulate mechanoreceptors utilizing these techniques. One other aspect to consider is pain modulation. It has been proposed that Kinesiotape may help suppress pain due to theories put forth by Melzak and Wall in the 1960’s. Their theory proposes a “spinal gate” that can be opened or closed depending on incoming stimuli. This “gate” is found in the substantia gelatinosa of the dorsal horn where impulses from type C (slow pain) fibers and type A (mechanoreceptors) fibers converge. It is proposed that if larger diameter fibers are stimulated than small diameter fibers the spinal “gate” is closed or at least the strength of the noxious stimuli is diminished (6, 7). It follows that the larger diameter neurons one can stimulate (muscle spindles, GTO’s, pressure receptors) the more pain one may suppress. By utilizing mechanical/functional corrections larger diameter neurons can be stimulated which in turn may help to “close the gate”. Kinesio Taping Technique is a new effective new modality being employed predominately by chiropractors, physical therapists occupational therapists and athletic trainers predominately. As with any new modality there is little clinical research to support its use. To date the mechanism by which Kinesiotape exerts its influence on one’s physiology has been ill defined. By analyzing the effects of Kinesiotape we can conclude that the majority of its influence is proprioceptive in nature. The most likely proprioceptors to be influenced are pressure receptors and mechanoreceptors, namely Meissner’s corpuscles, Merkel’s discs and muscle spindles. By understanding how they help modulate sensory input Kinesiotape can be more effectively applied and Kinesio Taping Method can continue progress. Johansson, K., Oberg, B., Adolfsson, L. and Foldevi, M. A combination of systemic review and clinicians’ beliefs in interventions for subacromial pain. British Journal of General Practice, 52, 145-152. 2002. Smidt, N., et. al. Corticosteroid injections, physiotherapy, or a wait-and-see policy for lateral epicondylitis: a randomized controlled trial. Lancet 2002, 359:657-662. Dorland’s Medical Dictionary. Edition 28, 1994. The Neurology of Joints by Barry Wyke. Human Anatomy and Physiology, Sixth Edition, 2004. Elaine N. Marieb.